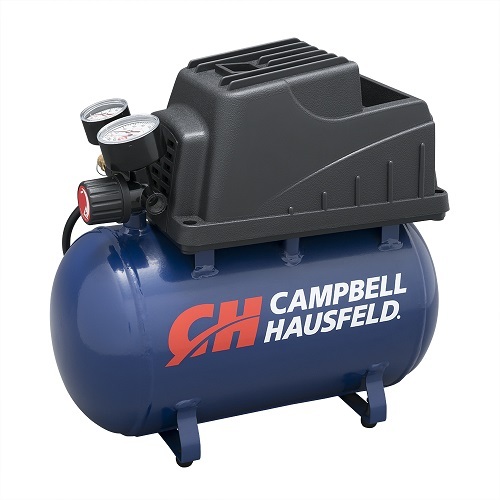 The Campbell Hausfeld 2-gallon, hot dog air compressor (FP209000AV) can handle multiple projects. 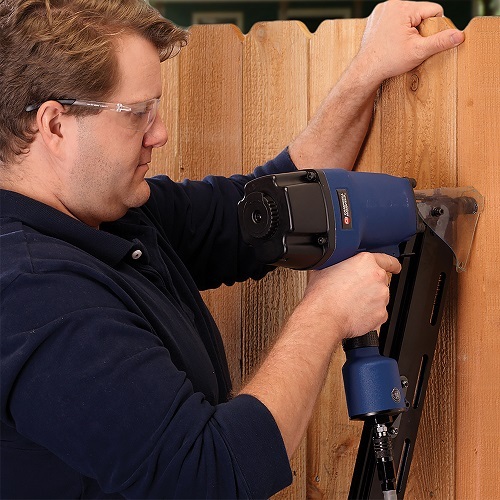 Its 2-gallon size makes it a great inflator for car tires, bike tires and sports balls; it’s also perfect for powering air nailers and brad nailers to install trim, complete furniture upholstery projects and more. 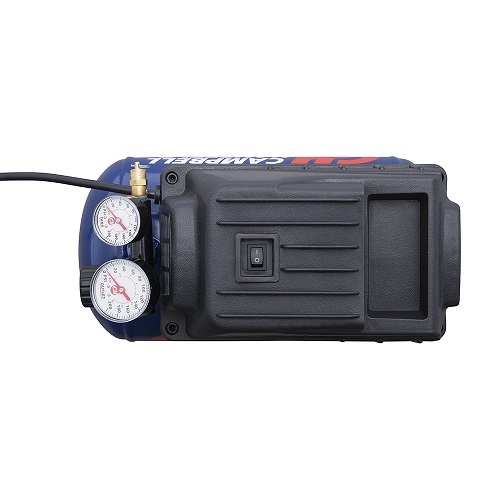 An integrated control panel with regulator and gauges is easy to read and use and this air compressor’s compact design makes it unit easily portable. Oilless pump for maintenance-free ownership. 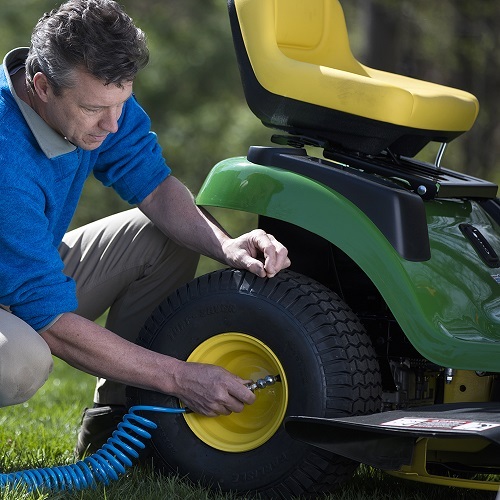 Includes a 25-foot recoil hose, needle, needle adapter, 2 inflator nozzles and air chuck so you can get started on projects right away. Operates on 120-volt household current. 110 Max PSI, 0.36 CFM @ 90 PSI. 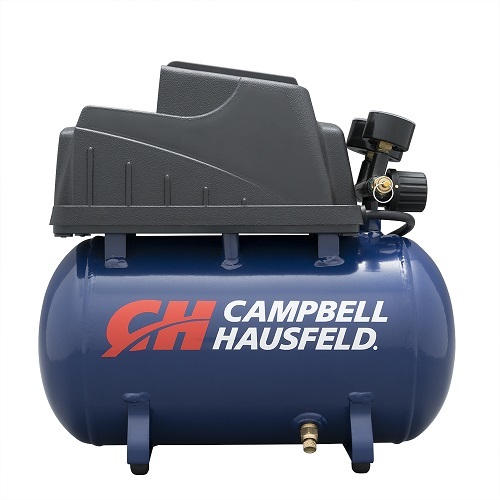 Great little compressor for fulling my motorcycle and push cart tires. Very lite and portable. 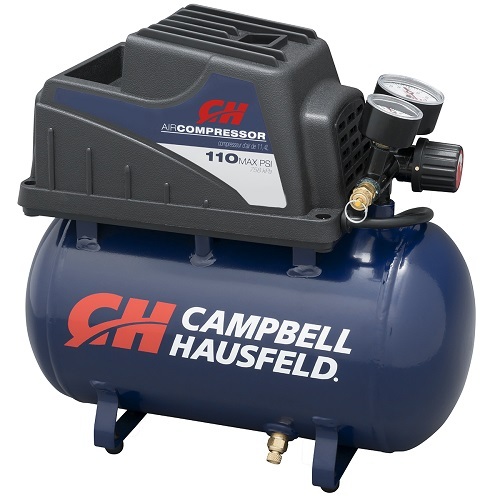 I have had the CH 2 gallon Hot dog compressor sense mid 2008. Installed it and power inverter into the tool box in my trucks bed. My idea was to use it for emergency flat repairs, instead I added some air horns (from Hornblaster.com). The compressor never seamed to hold air pressure for more then a day (likely from the double swivel i added) sense it seeped and I would regularly use the horns the compressor ran constantly. Two years ago I had to take it all apart and replace the electric motors brushes, they had worn down to nothing one was actually gone. After the repair it ran flawlessly again. After that I replaced the bottom vent with a 150psi Pop off valve, and rigged up a chain to pull and vent any moisture and debris, worked great. Recently it seamed to run constantly, seemed more violent then before and had no pressure. I found I broke a brass elbow fitting to my Pop off valve, fixed the leak and found the tank would hold pressure but wouldn't make it. I discovered the piston wrist pin had walked out and deeply gouged the cylinder which must've spun and then gouged a second spot. With constant use for nearly 10 years, unnecessary upgrades, and irregular maintenance (draining every year or two) this compressor has really held up! I would absolutely recommend it. I will be buying another and using the old tank to double to air capacity.